Savannah, GA is “One of America’s Most Haunted Cities,” as rated by the American Institue of Parapsychology, the Atlantic Paranormal Society, the Tennessee Wraith Chasers, and Ghost Adventures. And now you can experience it yourself with Savannah Ghostwalker Tours – a PREMIER tour for the discerning guest! Click on the “Book Online” button to buy now! Walk and hear the Savannah Ghost Story, history and legends of Savannah GA from an Experienced Guide. See photographic Paranormal Evidence collected by our guests while on their tour and submitted for your enjoyment. People have been dying here for over 286 years to get mentioned on our tours! “The Ghostwalker” is a professional, licensed by the City of Savannah to do ghost tours for over 20 years. He knows where the Hauntings of Old Savannah GA are…. and why! Walk with the spirits down the oak tree lined streets and shadow filled lanes. Pass by old antebellum homes and through eerie moss draped squares to the hauntings of Old Savannah GA.
Every haunted tour in Savannah will tell you ghost stories (if you can hear them above the drunken crowds.) But this is is the only place to hear the telling of the Ghost Stories, History and Legends of Savannah GA narrated by The Ghostwalker himself! Walk with him to our hidden cemeteries, battlefields and most horrific places, where 100’s died and the paranormal lives! 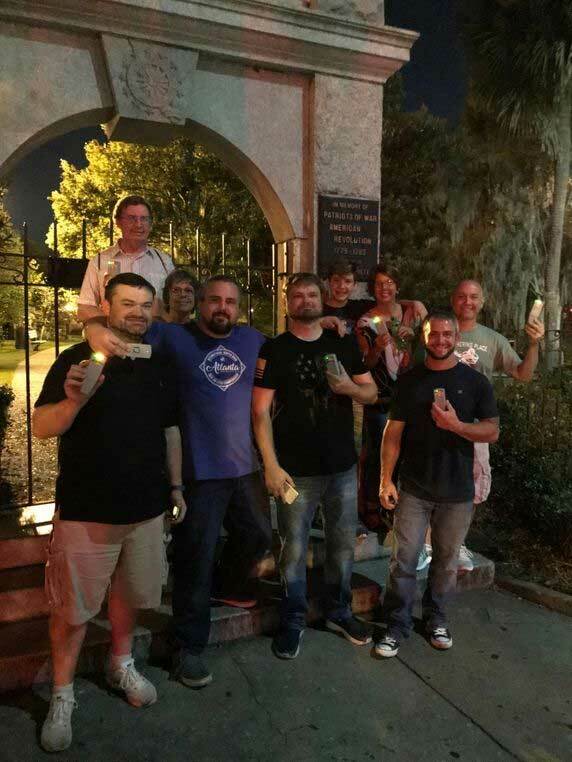 Experience what we call “The Savannah Chill”… even on the hottest nights, with Ghostwalker Tours here in Savannah GA. Get up close and personal with the ghosts at the cemetery gates… in the dark… if you dare!!! You never know exactly what might bump into you out there with The Ghostwalker. Come enjoy an evening walk down The Past Lane with Savannah Ghostwalker Tours. Advanced booking is required as this tour is limited to only 15 Guests per night. Don’t buy a “Groupon tour” and get packed into a mob of 30-60 drunks; walk with the GhostWalker in a small friendly group! Book Your Tour Online Now!